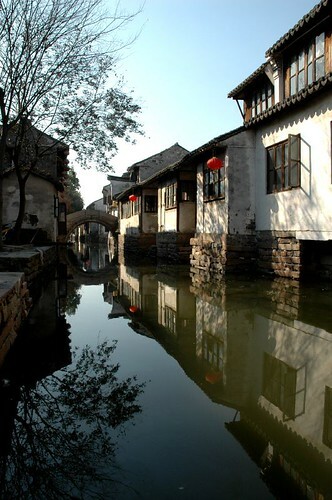 The majority of the video is shot at Zhouzhuang, which is a watertown known as the 'Venice in China' (or was it 'Venice in Shanghai'? Not sure...). The very same place Mission Impossible 3 was shot. Yeap, if you've seen the (very underrated) film, you'll recognize this place from the final scenes of it. That great long take where Tom Cruise was running through the place, pass the people and everything to find his wife (or was it to detonate a bomb? I can't remember...). My sister was pretty sick that day in Zhouzhuang, thus she seemed like a walking corpse. I think I had a bit of flu, thus my enjoyment there was slightly diminished too. Quite a pity. Music I used is Alvorada, which was used in both the Nacho Libre and City of God soundtracks. Yes, I used a Samba song for a video shot in China, I'm incredible.